Because band-aids really DON'T make it feel better. I hurt my toe. My big toe. I hurt it. No. Seriously. I almost broke the entire thing off. It happened on Saturday. When I was free and clear of children and other distractions and frankly have no possible excuse for opening the front door and falling all the way down my three steps. I just opened the door. And proceeded to throw myself downward. I mean, fell all the way like, sprawled out onto the concrete when it was all over (oh yes, all SIX FEET OF ME) in a painful position, wailing. Nicole understands how embarrassing it is to fall when one is over the average height of 5'5''. It's just. Awkward. And. Terrible. My dad, who can't hear much, unless you are speaking Democrat or Hunting, saw me laying on the bottom of the steps and thought perhaps I was picking my feet or staring at a bug or some other interesting thing that requires you to be in the crouching fetal position. But no. I was there. Looking at my big toe, which was bent almost entirely to the side. Then, as all mothers with responsibilities do, I panicked. Because, I am not ABOUT to spend MY Saturday couped up in the ER to get my TOE x-rayed. So. I had a good idea. I decided to bend my toe back into position myself. Why? I am not sure. In hopes of a miracle cure. There were none. Who told me I should just tape them together. And he found some tape. And taped my big, aching toe to it's neighbor, who was a bit disgruntled at having the weird kid taped to him. And I wiped my tears. Where I became even more pissed that I just fallen down the stairs and would now deal with a throbbing big toe all weekend. So I ripped the tape off. In anger. You can guess how well that went, too. And so, fast forward to today. When my toe is large and blue and painful. And my mom? She's doling out the tylenol and ice packs and doing a lot of preaching. About how, this one time, when her ankle was broken, I told her that if she wanted the dog fed, she would have to learn to get up and do it by herself. And I tried to kick myself for doing that to her. And now my toe hurts worse. So, contrary to popular belief, I have like, things to do. Laundry washing / folding / putting awaying. No, I am not home alot. Yes, my children probably spend more time at Mimi's than they do with Momma. No. Mom. It's only like, 9:30, and I have not, in fact, checked my email yet. Mom. You did research on toenails? YES! HAVEN'T YOU SEEN THE RIDGES ON SB'S TOENAILS? SHE HAS RIDGES! ON HER TOENAILS! Call me a negligent mother if you will. The child doesn't often wear deodorant and has three layers of creek-encrusted, pasture-walking dirt on her at all times. I do not EVER approach her toenails. WELLL! THESERIDGESCOULDMEANANYTHING! A THYROID PROBLEM!, A LIVER DEFIENCY!, INFECTION!, OR THEY COULD EVEN BE INHERITED! GENETICALLY INHERITED! CAN YOU BELIEVE THAT? IMEANWHENWETAKEHERFORHERSIXTHGRADESHOTS WE SHOULD HAVE SOMEONE LOOK AT THIS! SERIOUSLY! have everything at home accomplished such that I can indeed sit down and Google the words "toenail ridges". I have to go now. There are four emails awaiting me regarding toenails in my Inbox. Still sick. Flu has morphed itself into a stomach bug, lovingly picked up yesterday at some point during Jackson's surgery. Dear. God. I am so tired of a messy house, messy hair and pajamas. Someone save me. 30 Days : Day Two. Have you seen Baby Jackson lately? Here he is, in all his precious-selfness. I was there, as in, in the delivery room, when he took his first little breath. I never before realized what an honor this was - until of course, I was there, holding his momma's hand and counting to ten and telling her to puuuussssh. I was there. I was there when he and his daddy shared their first tears, and I watched his big sister hold him for the very first time. I. was. there. I. am. slightly. over. attached. Watching a baby enter the world heals alot of heartaches... it's a few hours of free therapy. 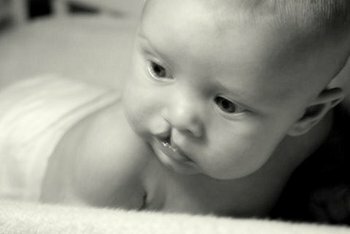 Jackson was born with a cleft-lip - which, due to some fabulous modern technology, his proud parents were prepared for. We saw it, right on the ultrasound, and watched him grow and change. His cleft is not a complete cleft, which, for those of you who might not be cleft-lip experts, is good news. He has his first of several surgeries scheduled for the end of February. I call him Elvis, since he currently has the perma-Elvis pouty lip look goin on. After the 2.5 million pictures I took in the delivery room, I struggled for a while with exactly "how" to photograph Jackson, cautious about recording a defect... something others, though not us, would see as "less than" perfect. His momma answers every question - even every raised eyebrow, with grace and poise. And here I am, camera in hand, selfishly struggling with how to get the perfect picture. What? And suddenly, I realized, Jackson is perfect. My brand of perfect... perfect with imperfections that make him 100% original. He's smiling now - and those pictures? Sheesh. I could post a million. His sideways grin is one of the only things I'll act like a complete idiot for. And now, 4.5 million photos later, we await the first surgery that will transform him into everyone else's perfect. And I find myself territorial. In include him here, on Day Two of 30, because he is part of Everyday here at The Farmhouse. At the ripe old age of four months, he has changed my life in more ways than he will ever know. And you? You can call me AUNT Rachael.